This entry was posted in Important Life Stories on January 3, 2014 by Steve Tilford. I’ve skied over the high point of the Birkie course 4 times now. I did it again yesterday, instead of snowshoeing out to the bear den. Up at the top, there is a sign and a big rock, that is now, covered with snow. Right here is where I helped spread the ashes of a friend, Harold Lundgren. Harold was an interesting guy. First and foremost, I think he would like to be called a cyclist. And he was. But he was much more. He was a friend, a farmer, a brother, and just an all around good guy. And by good guy, I mean the type of guy you could depend on for just about anything. He was a guy you would trust your most secret, secret, or your life. He was that kind of guy. I think of Harold fairly often. I think of him really a lot when I’m up here. The first time I skied on the Birkie course, it was just Harold and I skiing to the high point from OO. Probably the first 10 times I skied on the Birkie course, it was with Harold. I met Harold while riding for Michael Fatka. He was one of the original Iowa guys riding on the Raleigh team. He was going to Iowa State and into cycling. I didn’t know Harold that well initially. I got to know him better through the years. Harold wasn’t the best athlete, but he had heart. He would suffer like a dog racing, but I never heard him complain once. He loved the sport. I have a million Harold stories. I could go on for days. Once, he drove the 45 minutes down from Ames to pick me up at the Des Moines airport. When we got back to the shop in Ames, I couldn’t find my DayRunner, an organizer book, sort of equivalent to a cell phone nowadays, I guess. I thought I’d left it at a pay phone at the airport because I’d been making phone calls while waiting for my bike. Anyway, I tell Harold I have to go back to the airport to get it. He says he’ll drive me in the team van that he picked me up in. We get back to the airport and I go to the payphone and it isn’t there. Then I go ask at lost and found and it hasn’t been turned in. I am bummed. I get back to the van and on the floor, under the passenger seat, is my DayRunner. I am so embarrassed. I apologized to Harold, because he had spent and hour and a half to go out of his way driving me roundtrip to the airport for nothing. He is quiet for a second and then proceeds to thank me for letting him drive me. He said that he couldn’t think of a more enjoyable way to spend time, with a friend, just talking. He said it was the best conversation that he could remember having. It was so nice. Harold had bad frostbite on his face. The first year we skied, people would stop us all the time and tell him that he needed to go inside or go to the hospital. I was used to it by then. His nose and cheeks would turn white everytime we skied below zero, which was often those first years. He had spent a lot of time outside, farming, in the dead of winter, in southern Iowa, along the Missouri border. It was a hard life. A lonely existence, but he loved it too. After graduating, Harold moved back near home and farmed. He did that for a couple years, then eventually moved up to Ames and started working for a parent seed company. They made hybrid seeds and Harold would travel around the Midwest and plant and tend to them. He never stopped riding his bike, though. In the early 90’s, Michael Fatka was cross country bike touring. I think he was riding his bike from Oregon back to Iowa, but I’m a little sketchy on that memory. Anyway, Michael was only a few hours from Ames, so Harold decided to ride out to meet him. Harold was riding out west of Ames, on a paved road, when he was struck, broadside, by a car. It was a kid driving on gravel, in high corn. He didn’t see the stop sign, or it was covered up, but for some reason, he went right through it and struck Harold at full speed. It was just bad luck and an accident. I got a call from Michael that night telling me that Harold had been hit by a car and that he was in the hospital. I told Michael that I was on my way up. He said that no one was allowed to visit other than family and said I should wait a couple days. I thought that sounded okay. I was surprised when Michael called and said Harold had died. I guess he was pretty much dead on impact, but was still alive enough for his family to donate his organs to others. I couldn’t believe it. A few days/weeks later, his parents and his sister, decided to hold a memorial service at Iowa State. Harold had been cremated, but they thought that it would be nice and expected a couple dozen of his friends to get together to pay their respects. But it wasn’t a few dozen. It was 100’s of people. His first college roommate, just for a semester, flew up from Florida, I think, and told a life changing story that Harold had helped him through. Person after person stood up and all had their own account of a life changing situation that they consulted with Harold and followed his advice. It was unbelievable. Harold’s sister told about when she became pregnant and had decided to have an abortion. Harold supported her decision, but told her that it was really up to her to decide, not their parents, her friends, or others, to make this all important decision. She, and Harold, decided that it would be best to keep the baby. And that it was the best decision that she had ever made. And this wasn’t even the most moving of the stories. Harold’s memory service was a reflection of the impact that he had made on others. I have thought from that point on, that someones death, funeral, memorial, really mirrors or shows the importance that they meant to others. I think that many people would live different lives if they had the ability to see their funerals years before they died. 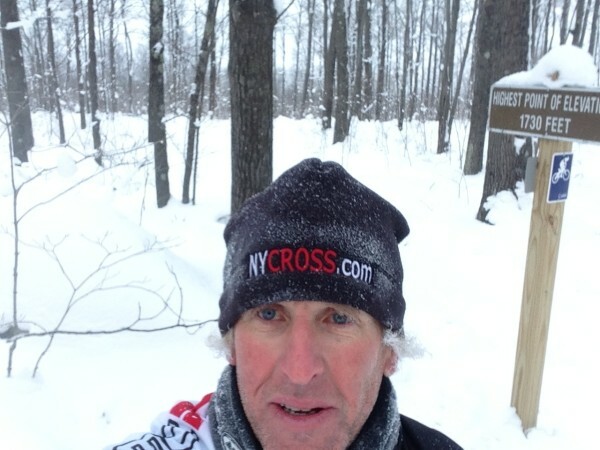 A few months later, I skied my first Birkie. I skied the race wearing Harold’s bib number. The day before the race, five of us, Michael, Trudi, Pete Caron, Paul Biskup and myself, skied up to the high point with a small film canister of some of Harold’s ashes. His parents had given them to Michael and told him that Harold had told them that it was one of “his” places. 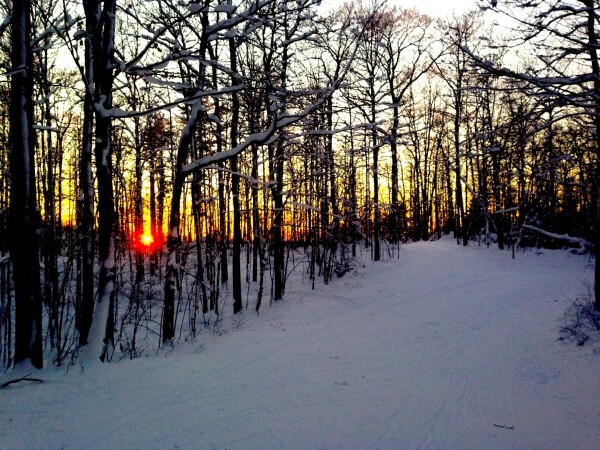 We were at the top of the high point, a sunset, on freshly groomed corduroy. Michael opened the canister and poured a small amount of the ashes into each of our hands. It was the only time I’ve ever actually touched human remains. It wasn’t like I had imagined. It was more like course, ground up bone or rock, not dusty ash. I put some between my thumb and forefinger and rubbed it together. I couldn’t really comprehend that this is what became of us. Each of us said our own little prayer for Harold. I thanked him for being my friend. Maybe my most loyal friend. I skied out of the 3rd wave the next day and qualified for the Elite wave, top 200. I don’t have a picture of Harold here. I’m sure I have some at home, on film. Maybe someone out there has one that they could send me and I’ll post it. Harold’s death made me a better person I think. I think I took Harold for granted. I didn’t realize how important he was to me or how special and unique person he was until he wasn’t around any more. It makes me feel bad I didn’t ever tell him how much he meant to me. But, I think it’s okay. Harold was the type of guy that could tell how people felt about him. He was a true friend. Sunset yesterday from the high point on the Birkie Trail. Looking North, down the trail from the high point. You can’t really see it that well, but over my shoulder, opposite of the sign is a rock covered with snow. That is what I consider Harold’s rock, I put his ashes there. I have a little personal conversation with him each time I ski over the hill. Wonderful remembrance Steve. I’m sure Harold felt the same about you. Thanks for sharing, we need more Harolds in the world. This may be one of the best post that I have read in a long time! In the end all we have are our friends and family. 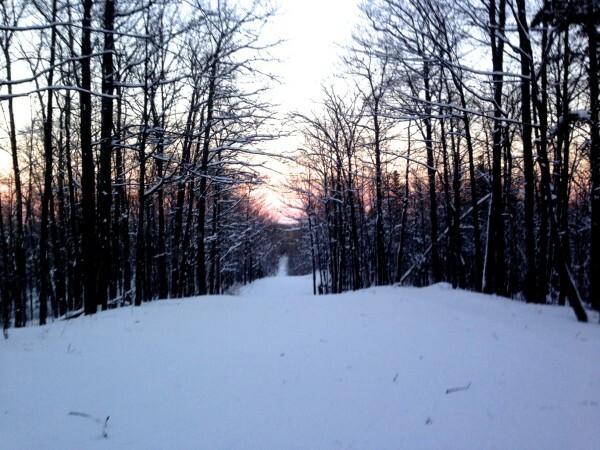 Something definetly lead you to ski vs. snow shoe yesterday. Thanks for this tribute! Sounds like he made a difference in this world. What a gift! Thank you for this post. I was expecting some wasted words on the 62yr old idiot doper after reading the name ‘Harold’. This was a much better start to my day. My wife is from Iowa. I hate to generalize but the great majority of the people that I have met there are just super grounded and solid people. fine thoughts of a faithful friend. Great looking woolly cap too. May you keep wearing it in great health! Damn Steve, best post in a long long time. Well done. Early comment about “needing more Harold’s” has it nailed… we should all strive to be like Harold and we should definitely appreciate the “Harold’s” we have in our lives. Great post, inspired writing, Steve. What an effective story. I concur with Brandall. Harold lives through you, and gratitude is the highest practice. Thanks. That’s a really great story on Harold. Thanks for sharing. I have clear memories of him being such a nice guy even though I didn’t really know him all that well as I was a handful of years younger than you guys at the time. I remember his overalls and big square jaw. Do you recall his crash at PAC in Superweek one year? His bike basically disintegrated underneath him and he suffered a ton of road rash and was even in a neck brace. I thnk it happened just short of the iron bridge on the back stretch. I don’t recall the exact circumstances but for some reason he gave me a ride back to Iowa from Wisconsin. I remember I really wanted to drive because he looked so uncomfortable. I was 14, had my permit and had been driving for almost a year but he would have none of it. Probably because he wasn’t my guardian and he also felt responsible for me. But I remember sitting in the front seat sort of petrified and watching him drive the whole way home. He was clearly in pain – probably the most road rash I had ever seen on anyone and he couldn’t really turn his head but he never complained once about it. It was pretty sad to hear years later what had happened. Again, thanks for sharing the story. Harold was one of the good ones. Chris-Harold later stopped in Muscatine and had emergency neck surgery. He was one neck turn away from completely severing his spinal cord. That wouldn’t have worked out good for either of you. I walked him out to his car when he left. He told me he felt pretty good, but was a little worried that when he woke up in the morning, his pillow was soaked from water pouring out of his ears. I felt pretty guilty about the whole thing. I’d taken him to the emergency room, after the race, and told them that he didn’t have any insurance and they should just check him out the most “affordable” way. They obviously missed the neck injury. He lost a lot of neck movement from that. He was riding a Raleigh 753 and the headtube just broke off and he face planted. Not a good deal. Exactly why I read this blog. Steve Tilford, for “just an old bike racer”, you are one heck of a storyteller. You’ve lived a pretty amazing life…thanks for sharing it with all of us. Great post Steve. A great example of what life is all about….the people around us. Please, please, please post a picture of Harold when you have the opportunity. I hope other friends and his family see this. Yes, Harold knew how much he meant to you, but your post also serves as a gentle reminder to ALL of US that it’s important tell those in our lives how much they mean to us and how much we LOVE them. I was out riding with a pal going the other way on Luther road that day. We saw Harold and naturally stopped for a quick chat. As always, whether rolling with Harold or going the other way I came away with the usual smile from seeing him. One of those exceptional people that we rarely meet in our brief stay on the blue spinning globe.